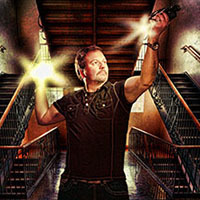 I had the good fortune of being asked to teach a “Shoot to Thrill” speedlight workshop at PhotoU last week in Columbus, Ohio. In our full-day workshop I focused on how to master using speedlights for virtually any type of lighting. I mixed studio-style manual speedlighting using Godox/Neewer 850 flashes with how to battle the sun with TTL (using Canon 600EX-RT flashes) and manual (Godox AD360 super flash). Here are a handful of my favorites that I created while I was teaching. None of the images have been edited or retouched in Photoshop. Just a few treatments using my Preset-o-Rama Lightroom presets and some cropping — that’s it. Demonstrating how to get a spiky sun effect. Captured in the middle of the afternoon in a vacant lot across the street from the conference hotel. Settings were 1/200 @ f22, ISO 100 using a Sigma 20mm lens. Lighting was from two Canon 600EX-RT flashes off camera. A pullback showing the lighting setup. Some of my workshoppers at work. This is the setting and the light conditions we were working with. Less than ideal, no? Excellent post. Looking forward to getting your books. Thanks for all your awesome tips!